MONT’ KIARA residents are never short of choices when it comes to food, grocery shopping, conveniences and amenities. The enclave, together with neighbouring Desa Sri Hartamas and Dutamas, offers plenty of eateries — from mamak shops to fine-dining restaurants — and places to shop with four supermarkets and three shopping centres in the area. Now the residents will have even more options with the opening of Bukit Kiara Properties Sdn Bhd’s (BKP) Verve Shops, which is the podium of Verve Suites in Jalan Kiara 5, Mont’Kiara. 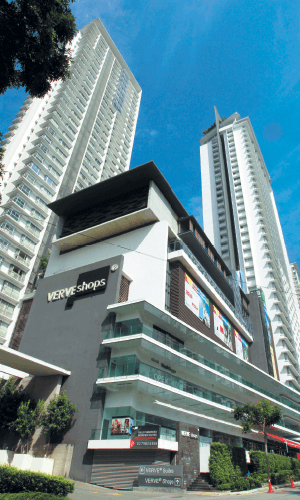 Verve Shops was completed in 2013 at a development cost of slightly below RM37 million together with the final tower of Verve Suites — Vox Tower. Comprising three floors of retail space, Verve Shops has a net lettable area of about 74,000 sq ft, with 24 retail lots of between 932 and 3,771 sq ft. The rental rates range from RM4 to RM9 psf. The 5.87-acre freehold Verve Suites project has a gross development value (GDV) of RM592 million. It comprises 933 fully furnished designer suites spread across four towers — Viva, Vibe, Vogue and Vox. The last tower was fully sold and handed over to buyers in December 2013. The development is a stone’s throw from Garden International School and a five-minute drive to Sri Hartamas. BKP says Verve Shops is a retail centre that offers conveniences and a great experience to those who love to enjoy the finest culinary delights. According to group managing director Datuk N K Tong, the focus of the development is to serve Verve Suites’ residents and the local and expatriate communities in Mont’Kiara. “While there are other shopping centres in the vicinity, Verve Shops will provide a different retail experience. Many of the tenants are offering services that benefit the community, such as innovative healthcare services, childcare and education, F&B (food and beverage) options and a supermarket,” he says. 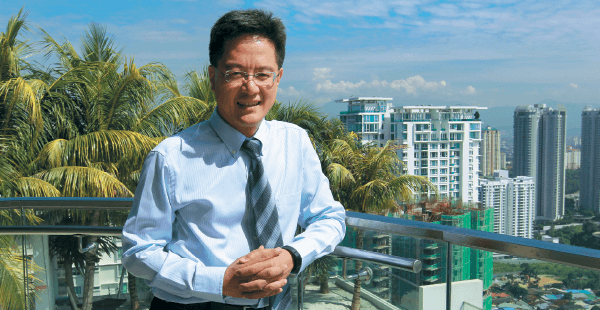 CB Richard Ellis Malaysia (CBRE) managing director Allan Soo believes that Verve Shops’ success will depend on its exposure to the street and the wider neighbourhood, and not just the condominiums above. “In affluent suburbs like Mont’Kiara, which are supported by international communities, the opportunity for new bohemian retail is accentuated. So, this will help the likes of Verve Shops,” he says. “Our tenants will be, by nature, more niche and higher value-added, as is already demonstrated by the current tenant mix,” Tong says, adding that BKP has made a conscious decision not to bring in fast food operators as they will not cater for its target market. Its F&B tenants are Café D’Fong, a place for dim sum lovers; Podgy & the Banker+, a café serving pastries, sandwiches and coffee with Melbourne-infused concepts; B-Lab Bistro & Bakery, which offers a spread of fusion food, breads and pastries; La Casa, a cosy and casual restaurant serving Italian food; and Joe Break & Afters, a quick-service café offering a variety of salads, cookies and ice cream. Its service tenants include Wash Shoppe, which offers laundry services; AKI Hair Studio, a boutique-concept salon; and MyNEWS.com, a 24-hour convenience store. Education and medical services are an important part of Verve Shops’ tenant mix. International preschool Steps Ahead Learners is located on the first floor and playschool, nursery and preschool provider Trinity Kids Malaysia, on the fifth floor. As for medical services, there are Forest Village Clinic, which is owned and operated by a group of Japanese doctors; Podiatry Works, offering podiatry services and facilities; HealthWorks, offering cutting-edge muscle re-education systems; and Kuala Lumpur Sports Medicine Centre (KLSMC), a specialist centre that focuses on health, fitness and well-being with emphasis on the musculoskeletal system. Tong believes that KLSMC and HealthWorks will complement each other because they focus on sports therapy and postural correction. The final tenant to sign on is also the anchor — Jaya Grocer. In fact, it took up Verve Shops’ remaining lots, which measure 7,978 sq ft. The supermarket will start operations by March and will offer a “cook for you” service in the open area where a designated chef will cook for customers for RM6. “Typically, you would bring in an anchor tenant first and enhance the rents for other shops. But we did it the other way around by accident. However, it was fortunate because we didn’t think that major supermarkets would be interested in this location,” says Tong. Jaya Grocer was introduced to Verve Shops by another tenant. All the lots were leased out by the middle of last year, and Verve Shops will be fully occupied by March. “I’m optimistic that [Verve Shops] is going to be one of the most convenient retail centres in the Klang Valley, and we hope the [current] tenant mix is good [enough],” says Tong. According to CBRE’s Soo, Verve Shops should not be seen as a retail development that functions like a mall. “It can remain boutiquey as long as stand-alone artisan-type operators occupy it. This applies to many of the high-rises in the country where the podium is designed for supportive retail only … there are no provisions for supermarkets, delivery bays, back-of-house and other support for the retailers,” he says. Sharin Sharil of Podgy & The Banker+ tells City & Country that the uniqueness of Verve Shops is that it serves as an alternative for people in the vicinity to shop, minus the parking hassle. In fact, the 225 parking bays at Verve Shops are a pull factor for the tenants. Parking is currently free for customers, but Tong says the company may start charging a fee in the near future, perhaps RM1 per hour. Lee Meng Tuck, principal and CEO of Kiara Realty Sdn Bhd, foresees that when Verve Shops becomes a popular spot, the vicinity will face traffic congestion if the situation is not managed well. Sharin says while business is satisfactory, the stretch outside Jalan Kiara 5, which is Jalan Desa Kiara, can sometimes be congested, especially when the nearby schools end for the day. Lee says Jaya Grocer is a “good enough” pull factor and believes that Verve Shops is less congested compared with 1 Mont’Kiara Mall in Jalan Kiara. “While we anticipate a decent volume of traffic, this will be well managed with the ample parking space provided, which is far beyond the requirement,” says Tong. Possible traffic problem aside, he says Verve Shops was not advertised and was fully leased through referrals. He notes that the tenants are keen to represent themselves in the area. Tenants and residents will not have to worry much about the maintenance of Verve Suites and Verve Shops as this is something BKP always takes pride in. “Like our chairman [Datuk Alan Tong Kok Mau] used to say, our relationship doesn’t end but begins when we hand over the keys. That’s when the real interaction takes place. Even till today, we are still doing fortnightly site walks to see what else needs to be improved,” says Tong. Verve Suites was awarded the Best High-rise Residential Award at the Malaysia Property Awards last November, organised by Fiabci. “We have been very happy for our customers. The fact that we won an award is a nice bonus. But it wasn’t something that we planned for,” he says. Tong is currently focusing on Verve Suites KL South, a luxury serviced apartment block in Jalan Kelang Lama. The 1.36-acre freehold development comprises 321 fully furnished apartments and 45 small offices/home offices and retail units with an estimated GDV of RM310 million. Verve Suites KL South was previewed in June 2013 and scheduled for completion by mid-2016. To date, about 40% of the units in the first tower have been sold. The second block will be opened for sale when the first tower has achieved a take-up rate of 70% to 80%. BKP’s upcoming projects include the 5-storey Ambangan development and Verve Suites KLCC in Jalan Tun Razak. The latter, a high-end apartment project covering 0.9 acre of freehold land, has an estimated GDV of RM350 million. The Ambangan project comprises 19 units and is located in Persiaran Madge, Kuala Lumpur. Spread across 0.96 acre of freehold land, it has a GDV of RM100 million. Tong says this project has been approved, but BKP wants to undertake one project at a time. “We want to be more focused. It’s not about revenue or profitability … we want to make sure that we do a good job. For now, we are concentrating on the city centre with fairly high-density developments. We are also opened to suburban [projects] … even considering some landed developments there,” he says. BKP has also ventured overseas with Koharu Resort Hotel & Suites in Hakuba, Japan. Opened in December 2013, this premier ski resort is an hour’s drive from Nagano City. The first phase comprises 16 units of accommodation, ranging from studios to 1 and 2-bedroom apartments and 3-bedroom penthouses. All the units are for sale, with prices ranging from US$170,000 (RM612,000) to US$700,000. As at Jan 8, the resort had 85% confirmed bookings for the month and 65% for February. BKP is also looking at developing projects in Australia. Tong says it may go for small apartment projects in Adelaide, Perth and Brisbane. Tong expects housing development cost to continue to rise this year because governments around the world are printing more money. He also forecasts massive quantitative easing (QE) programmes. QE is a monetary policy in which a central bank purchases government securities or other securities from the market in order to lower interest rates and increase the money supply. It increases the money supply by flooding financial institutions with capital in an effort to promote increased lending and liquidity. However, if the money supply increases too quickly, QE can push up inflation. Tong believes Malaysia does not have enough houses to keep prices low. The UK market, he says, has 2.5 persons per household compared with Malaysia’s 4.5 to 6 persons. Yet, the trade unions and the central bank governor of the UK are telling the government that more houses are needed to keep prices down.